The richest horse race on the planet - the Grade 1 Dubai World Cup comes our way from Meydan Racecourse in the United Arab Emirates on Saturday, March 29. Horses four years old and upward will be after the winner's share of the lucrative $10 million purse when they go 1 1/4 miles on Meydan's Tapeta surface. 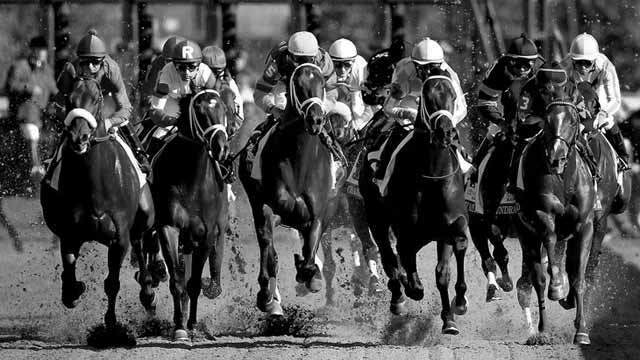 The Road to the Kentucky Derby starts to really ramp up after this weekend - the last of the races in which 50-20-10-5 points for first to fourth were contested with the winners of the Spiral Stakes at Turfway Park and the Sunland Derby at Sunland Park virtually guaranteeing themselves a starting spot in the Run for the Roses in May. New Mexico's Sunland Park will play host to the Grade 3 Sunland Derby this Sunday, March 23 - its signature event. A very generous purse of $800,000 and 50 qualifying points toward the Run for the Roses will be on the line for three year old Kentucky Derby hopefuls willing to go 1 1/8 miles on Sunland Park's main track. The Grade 3 Horseshoe Casino Cincinnati Spiral Stakes is on tap for this Saturday, March 22 from Turfway Park in Florence, Kentucky. Some of the best three year olds in the land will take to Turfway Park's Polytrack surface and go 1 1/8 miles for the winner's portion of the very nice $550,000 purse and the 50 qualifying points toward the Kentucky Derby in May. The Grade 3 Pure Romance Fathead Bourbonette Oaks is on tap for this Saturday, March 22 from Turfway Park in Florence, Kentucky. Three year old fillies will be featured as they go one mile on Turfway Park`s All Weather Track in search of the winner's share of the $125,000 purse. Santa Anita Park in beautiful Arcadia, California will play host to the Grade 2 San Luis Rey Stakes this Saturday, March 22. Horses four years old and upward will go 1 1/2 miles on Santa Anita's turf track searching for the winner's share of the $200,000 purse. The Grade 2 Inside Information Stakes comes our way this Saturday, March 22 from Gulfstream Park in Hallandale Beach, Florida. Fillies and mares four years old and upward will be after the winner's share of the $200,000 purse when they dash seven furlongs on Gulfstream's main track. The Grade 3 Excelsior Stakes comes our way this Saturday, March 22 from Aqueduct Racetrack in Queens, New York. A purse of $150,000 will be on the line for horses three years old and upward willing to go 1 1/8 miles on Aqueduct's main track. Santa Anita Park in Arcadia, California will play host to the Grade 2 Santa Ana Stakes on Sunday, March 16. Fillies and mares four years old and upward will be featured as they go 1 1/8 miles on Santa Anita's turf track as they search for the winner's share of the $200,000 purse. The Grade 1 Santa Margarita Stakes comes our way from Santa Anita Park in Arcadia, California on Saturday, March 15. A nice purse of $350,000 will be on the line for fillies and mares four years old and upward willing to go 1 1/8 miles on Santa Anita's main track.